With Patti and most of the rest of the household up and out already, I was afforded a blissful but all too brief lay in this morning. Today is the last full day here before we are London-bound tomorrow. For a chance, we thought we’d go out for a cooked breakfast this morning ... and by change, I mean Denny’s instead of Waffle House. Although we’re in the final stretches of the holiday, there are one of two places of interest we can visit to squeeze the very most of out the trip. 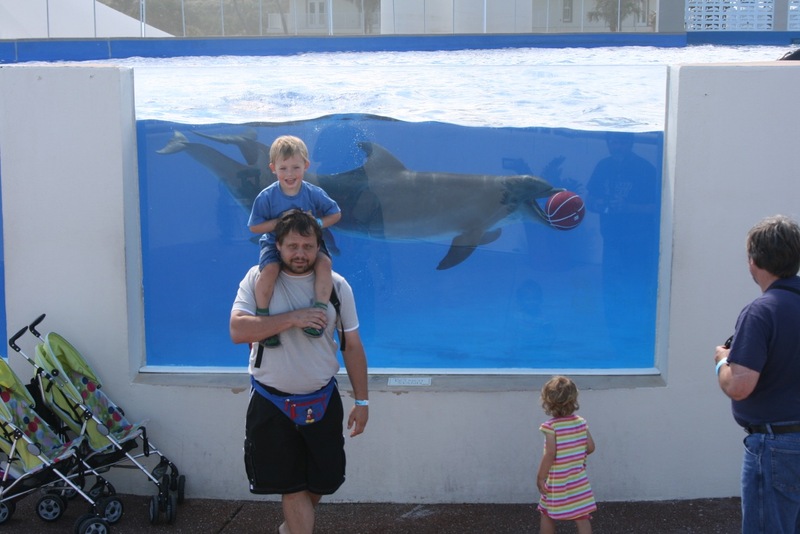 Just up the coast, about halfway between Palm Coast and Jacksonville, is Marineland. This is a small dolphinarium with just a few pools containing a handful of dolphins and little else. Despite the brief nature of the attraction, we all had a very good time. The weather was brilliant and with such a small area, there was little chance of loosing track of the kids as they ran around and this always makes for a more relaxing time when we’re out and about. We got to hear all about the life of the Atlantic Bottle-nose dolphins and how those here in captivity came to be here. The longest kept dolphin in captivity is right here in Marineland. One dolphin in one of the pools was playing with a basketball and on a couple of occasions managed to toss it clean out of the pool, only narrowly missing Jennifer right on the head. We also got to see the trainers at work training the dolphins - or possibly it was the other way around. It’s said after all that dolphins are amongst the cleverest of creatures, having the ability in less than two days of teaching Americans to stand on the side of the pool and feed them fish. We had the option of feeding the dolphins but at $26 per person (including the kids), we felt this a bit too expensive given that we’d already done the same at Sea World for a fraction of the cost - and I thought it was expensive there too. Just outside of the Marineland main building was an ice-cream stand and some shade to we indulged ourselves whilst the kids ran around letting off yet more energy (just where they get it from remains a mystery to me). The sun was bright, the sea air fresh, the sound of the waves crashing comforting, the kids enjoying themselves and we were relaxed. Once again, we enjoyed that ‘life is good’ feeling. I guess it was worth the trip up the coast after all. On the way back down towards Palm Coast, we stopped off at a McDonald’s that had a nice play area - evidently, the kids still had more energy to burn. We also stopped off at target for some last minute bargains. We’re coming away from the shops with progressively fewer bags each time now so this is a sure sign indication that we’re either all shopped out or that we’ve picked up all the bargains that are to be had. We still have to try to cram everything into the bags and this is still concerning me somewhat. Back at Patti’s, we bathed the kids, sat them in front of the DVD player for a bit and finally put the to bed. Patti had bought a huge slab of prime rib for dinner tonight and I have to say that it was without a doubt one of the best prime rib meals I’ve ever had. The meat was absolutely divine and done to sheer perfection. Throughout the remainder of the evening, Sandy packed and re-packed everything so as to ensure that all the weight was distributed evenly over all the bags. We are going to be taking the very maximum allowance of eight bags all of which are 50Lb (23Kg) in weight. Added to this is the double buggy and the two single buggies. There was just enough time to run through a slideshow of the day’s takings before a very late trip upstairs to out beds. I was too tired to write up the blog.